Time to clean up after RetroChallenge. 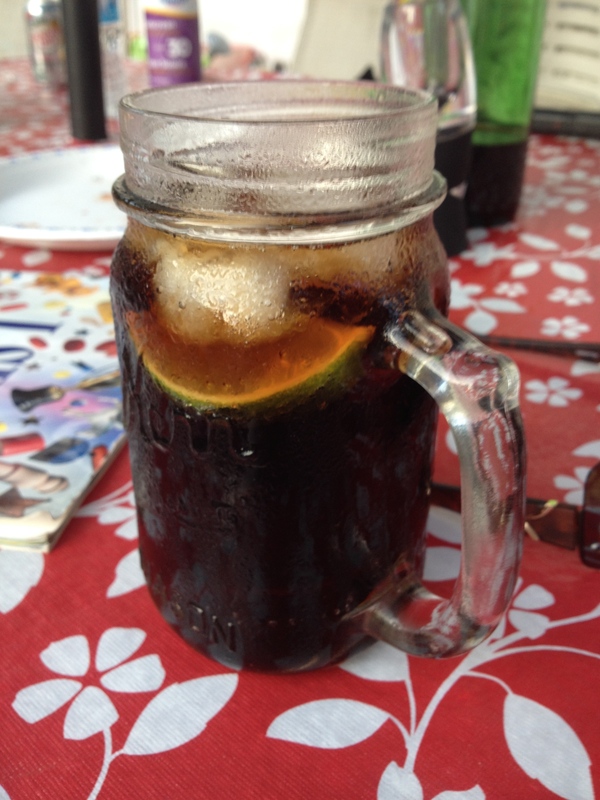 The pressure is off – I’ve written my last post. But I was still bothered by the second memory board that wasn’t working. This was the reason that I wasn’t able to get everything done that I wanted to get done. Maybe just an hour or two looking at the board and I might be able to track down the problem. Electrically, all of the power rails were good. However, no memory banks were showing up no matter what dip switch settings I chose. 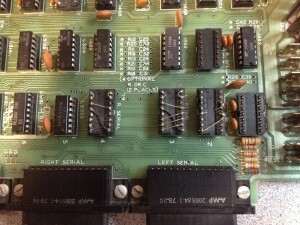 If you recall, I had a problem with dirty dip switch contacts on the first memory board. Initially, I didn’t even suspect a bad switch on this one because there was nothing showing up. But I pulled out the meter anyway, and checked the dip switch. All 8 switches were either open or very high resistance. That’s why nothing was showing up – the machine thought I had disabled all of the banks. A few sprays with contact cleaner (still can’t find my non-lubricated can), and some vigorous switching, and now the contact resistance was down to almost zero. Back into the machine. Much better. Four banks detected. However, two of the banks failed a memory test. From the results of the memory test, I was able to determine that there was two stuck bits in one bank, and one stuck bit in the other bank. 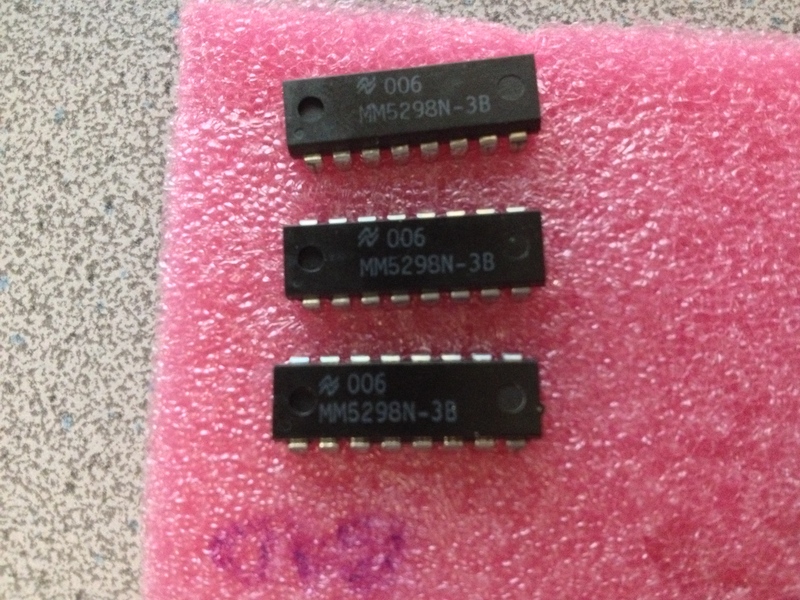 Without any spare DRAM chips, I decided to sacrifice one bank and make three good banks on the board. 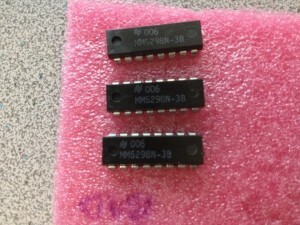 A visit to the schematic showed me which chip was which bit, and I was able to swap out a few chips. 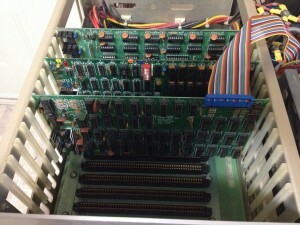 Another memory test, and I had 3 good banks for 24k of good RAM. I put both memory boards back in to the machine, and let it run a memory test for the full 56k of RAM overnight. Now that I’ve got an almost-full compliment of RAM, I wondered if I could get KERMIT to build successfully. 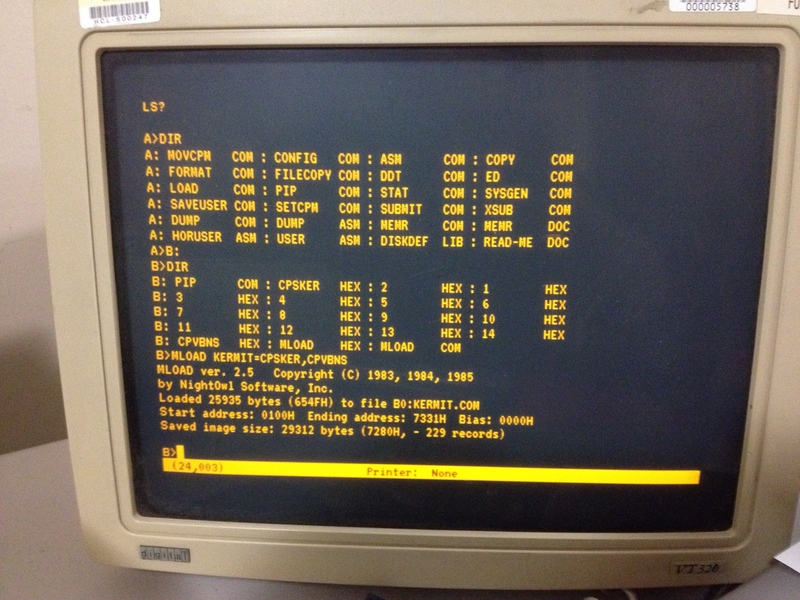 I still had the HEX files sitting on a data floppy, so I booted up and gave MLOAD a try. It worked! I was able to build a KERMIT binary. This is the point that I wasted several more hours trying to get KERMIT to actually transfer files, however. I was completely unsuccessful getting a file to move over, which was a bit disappointing. The whole reason I wanted KERMIT on the Horizon was to make moving binaries over to it much simpler. 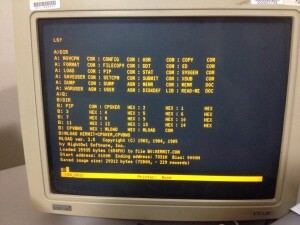 I had a binary for CLINK, a terminal program that works with the Hayes Micromodem 100, that I wanted to move over. It wasn’t going to happen with KERMIT, however. 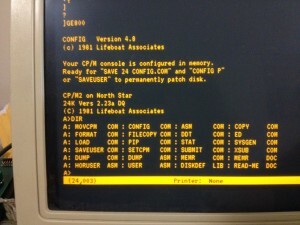 On the NorthStar, I was getting quite proficient using “PIP file.HEX=CON:” to copy a text file over the serial link. This does;t work with binaries because PIP is waiting for an end-of-file ^Z which may appear in the binary. A different approach was needed. Maybe I could turn CLINK.COM into a HEX file first, then move it over, and convert it back once it was on the Horizon. What file formats was I working with? The CP/M .COM file format is very simple. It’s just pure binary data that gets loaded into memory location 0x0100 onwards. There’s no file headers or anything to worry about (at least in CP/M 2 – there is in CP/M 3). 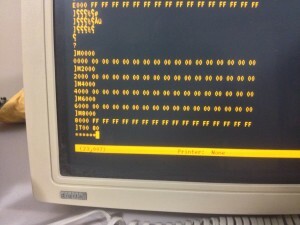 The .HEX file is just an Intel hex file – very common for burring EPROMs, etc. Could I find something that I could run on my Mac that could convert for me? Yes. Once I had clink.hex, I used the PIP trick to move it over, then used MLOAD to turn it back into a COM file. Now that I had the software, I needed to make sure the modem was working. Everything checked out electrically (250mA draw on the 5v rail), so I plugged it in to the backplane. A quick test with CLINK made the modem click away the number I entered (pulse dialling). A quick rummage around found a telephone extension cable, and I plugged the modem in to the phone line. All hooked up. Can it make a call? For some reason, there aren’t that many BBSs around any more 🙂 @retrocosm was kind enough to furnish me with the (UK) phone number to his BBS that was born during his 2011 RetroChallenge entry. 8 data bits, no parity, 1 stop bit, 300 baud. Time to call. No speaker on this modem, so I don’t get to hear the heart-warming sound of modems connecting, but a few seconds later, and I’m connected! 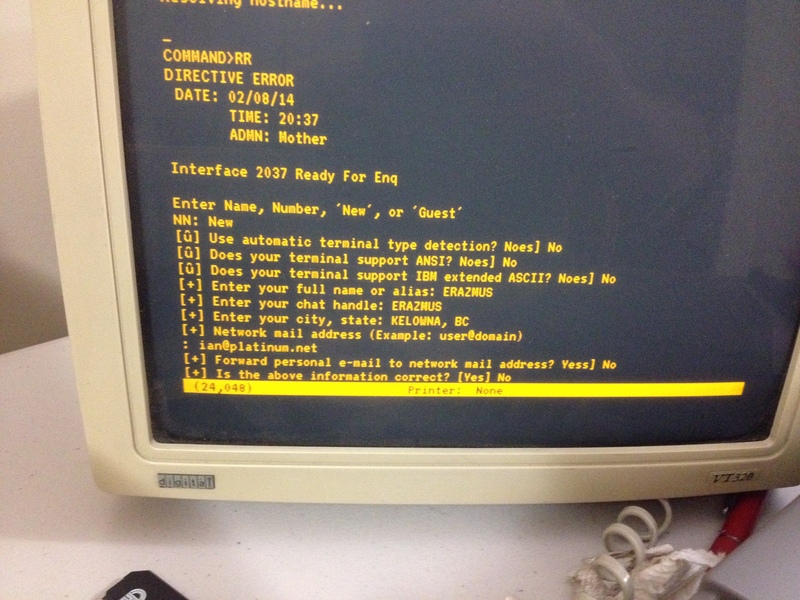 Ending RetroChallenge by dialling into a BBS created for a RetroChallenge using my RetroChallenge entry was somehow very satisfying. I’m glad I spent the extra couple of days to tie up the loose ends. That’s it for Retrochallenge 2014. I didn’t get everything done that I wanted to, but I’m still very happy. I finally got to scratch an itch that I’ve had since 1977 – I now own my very own S100 machine. 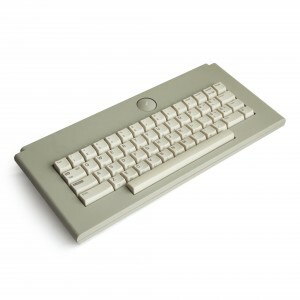 I would pour over the latest issue of Byte magazine and drool over the latest S100 board that had been released. 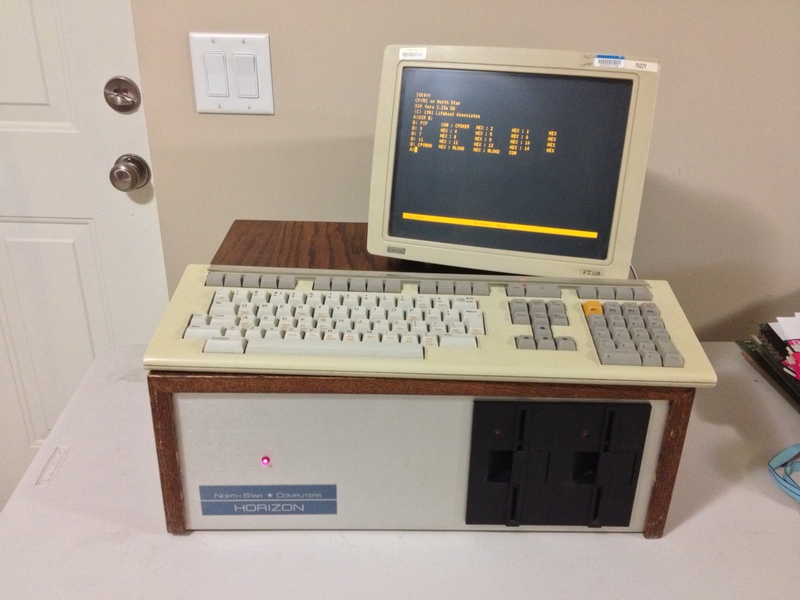 There was no way I’d ever be able to afford one of these amazing machines, so my computing itch had to be scratched by my Compukit UK101. So what did I accomplish during the month of July? I was able to fully disassemble, test, and restore the electronics of a NorthStar Horizon. I managed to get a working boot disk on media that is almost unobtanium. 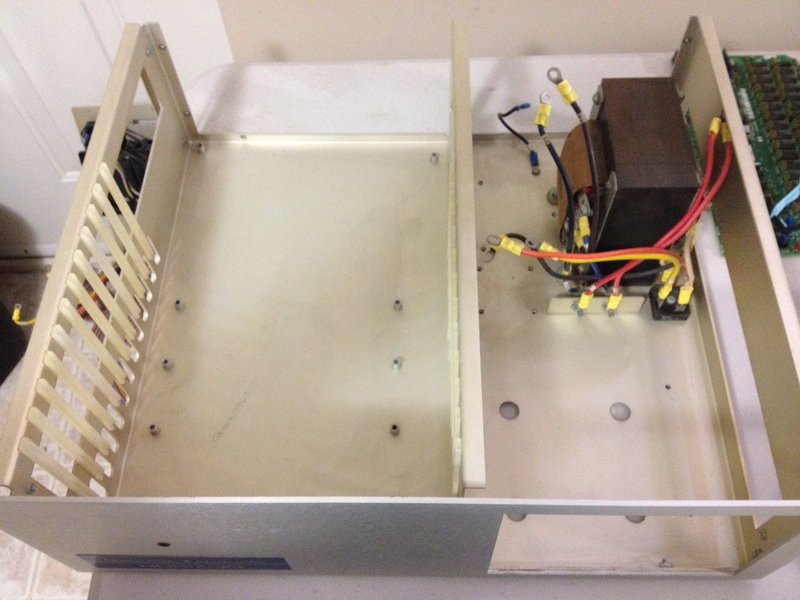 The most iconic part of this machine – the wooden case – still needs some love. I still have one broken memory card, which I am going to use as the reason for not getting any further. I have spent the last week trying to get Kermit-80 transferred and running. After running into buffer overrun errors while trying to transfer the big HEX file, I broke it up into smaller chunks, which transferred successfully. I was able to stitch the pieces back together using PIP. But no matter how many times I tried, I was unable to get LOAD or MLOAD to confer the HEX file to a binary. Tonight I started looking at the hex file a bit closer. From my rudimentary knowledge of Intel HEX files, it looks like the last few bytes are at address 0x7070. That’s 28k – real close to my 32k ceiling. No idea how much RAM CP/M needs, but I doubt that I’ve got enough memory to have CP/M, MLOAD, and the hex file all in memory at once. What’s next? I fully intend to get the second 32k memory running – I have a bus extender board and plenty of appropriately-aged test gear. 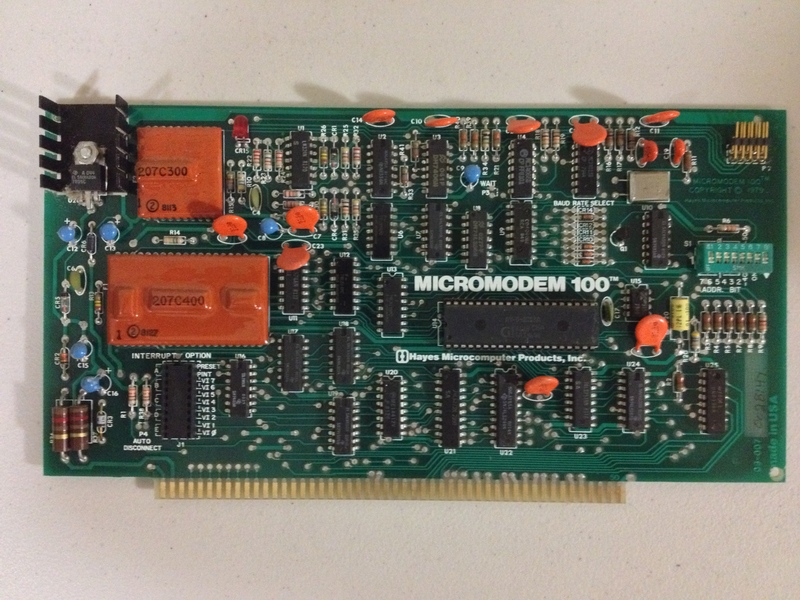 Once I’m back to a full compliment of RAM, I really want to get the Hayes Micromodem 100 running. Watching Tezza’s Retrochallenge demo code bring up text on the screen at teletype speeds really brought back memories of BBSs at 300 baud. I’ve had loads of fun. I’ve really enjoyed watching all of the other entries, and some of them have given me some ideas for the Retrochallenge Winter Warmup… Bring it on! 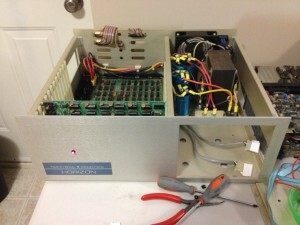 One last board left to make a basic working machine. 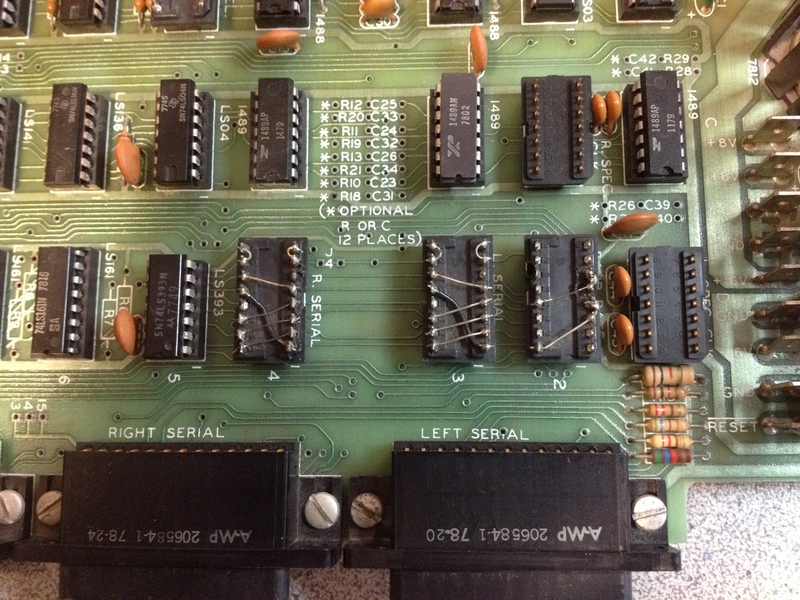 The disk controller board was completely socketed, so I removed each chip one at a time and used the glass pen to clean corrosion off of the pins. All capacitors tested okay, and a current-limited power-up proved successful. 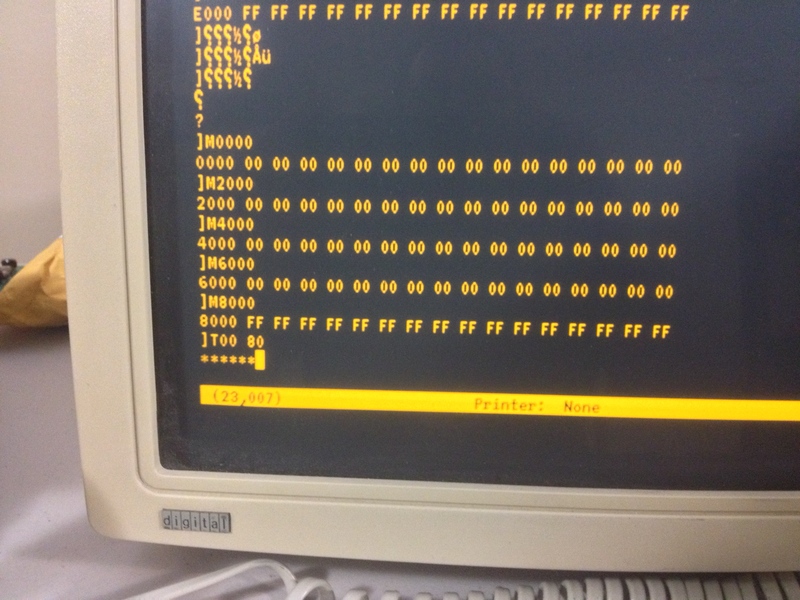 I placed the board in my machine, and I was able to see the boot ROM at address E800 visible from my monitor. Then it was time to plug the floppy drive cable in. After reading online about warnings of destroying floppy drives and controller cards by plugging in the cable backwards, I spent a bit of time double-checking that I was plugging the cable in correctly. 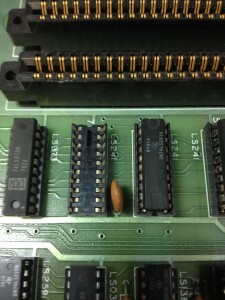 It was a good thing I did double-check – the pin 1 identifier on the connector was wrong! 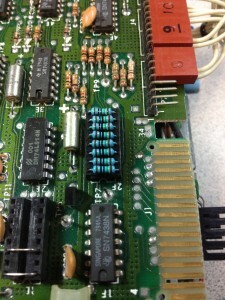 The ribbon was correct – the brown wire was pin 1. Once plugged in, I powered up, and jumped to the boot code at E800. Success! Drive 1 started to spin and the LED lit up! Now came the difficult part. Any NorthStar Horizon collector will tell you that the hardest part about bootstrapping the machine is the fact that the floppy disks are hard sectored. It is highly unlikely that you’ll haver any other machine around that can write these disks, so creating a boot disk is a challenge. 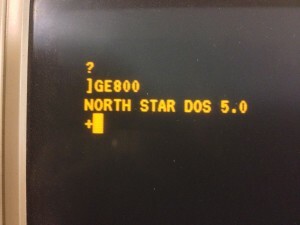 Thankfully, Dave Dunfield has done the hard work by making a neat bootstrap stub that talks to a DOS utility for reading and writing NorthStar disk images. This is the whole reason I needed to install the monitor ROM in the first place – the monitor ROM is the absolute minimum needed to get code in to the machine. 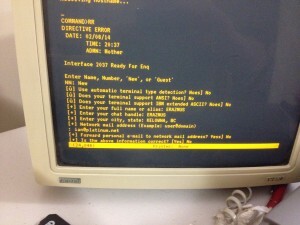 Dave provides instructions for getting his DOS utility to pretend to type in his bootstrap stub into the monitor prompt. I ended up digging out an old Toshiba Satellite 110CT laptop (with broken hard drive and dead battery). Of course I had no boot floppies for this machine, so I had to pick up a USB 3.5″ floppy drive for my Mac to write a DOS 6.22 disk so that I could boot the DOS laptop so I could use it to boot the Horizon! 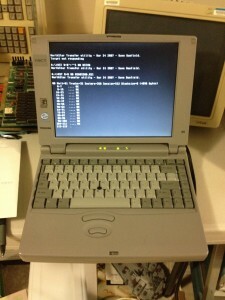 The first disk I was able to make with this setup was NorthStar DOS. 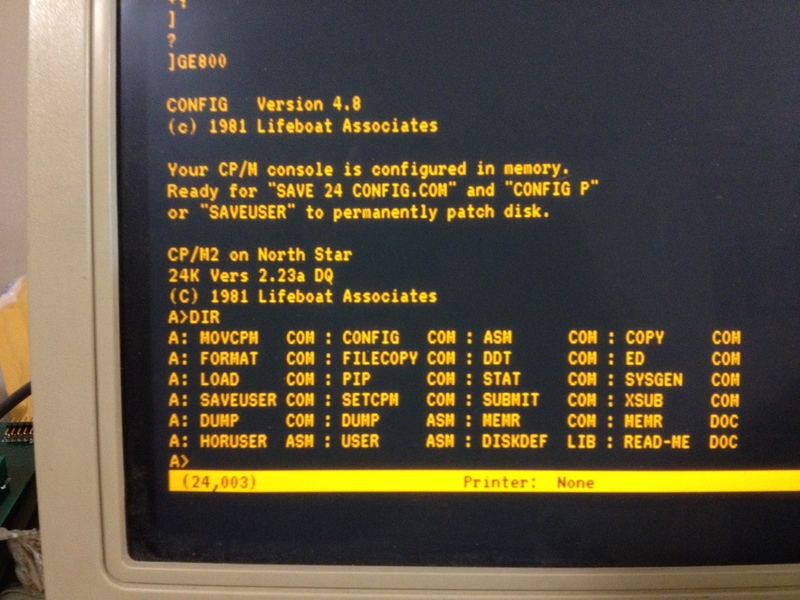 A quick toggle of the reset switch, and my NorthStar booted NorthStar DOS! 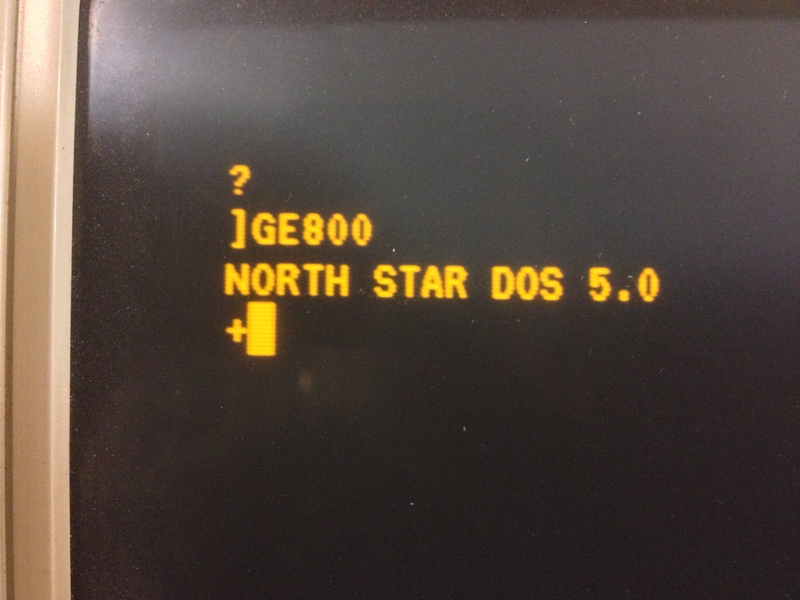 A few minutes of playing confirmed my suspicions of NorthStar DOS – it’s weird. For 1975, I’m sure it was quite powerful, but having to allocate sector ranges for each file is a bit tedious. I played with it long enough for me to comfortably say that I’ve tried it and it’s not my cup of tea. The next logical step was to try to get CP/M up and running. Knowing that I had double-sided double-density drives (called Quad Density in NorthStar lingo) I tried to write a CP/M disk that was in QD. This failed half way through every time I tried it. I was unable to get Dave’s software to write a double sided disk no matter what I tried. A bit more digging, and I found a single-sided CP/M image. This disk wrote successfully, and I was greeted with the friendly A> prompt after rebooting. I configured CP/M to recognize double sided double density drives, and I was able to successfully format, write and read double sided disks. Thankfully it’s just Dave’s software and not a problem with my double sided drives. 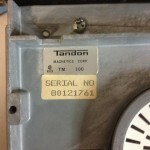 My NorthStar Horizon came with two Tandon TM100 floppy drives. As I mentioned previously, these were jumpered for drives 3 and 4. I don’t have any other drives to plug in to this system, so I need to re-jumper these for drives 1 and 2. 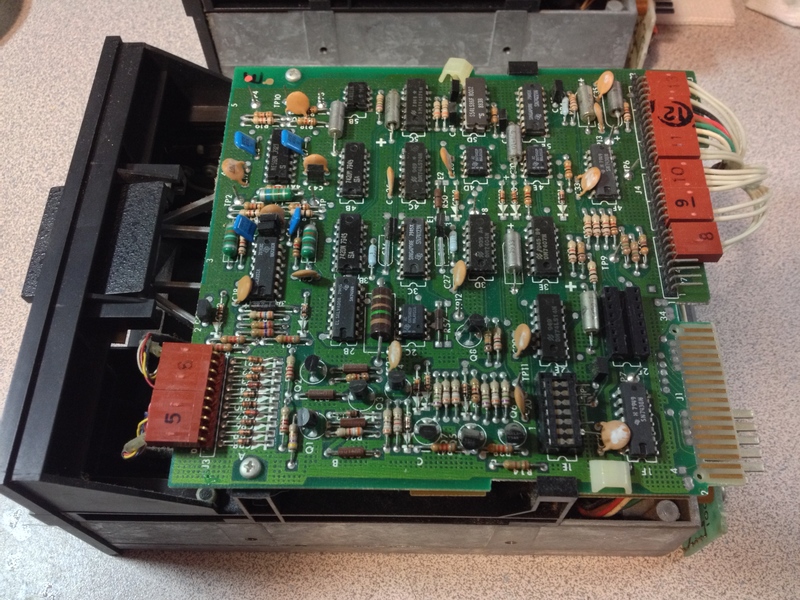 Even though the service manual is easily downloadable from the net, I don’t have an alignment floppy disk, so I needed to be careful disassembling and cleaning those drives. I took great care not to take apart any assembly that would alter the alignment of the heads or the track 0 sensor. This limited me to basically removing the circuit board to gain access to the mechanism below. The floppy drives were in remarkably good condition. The belts are snug, with no signs of slipping. 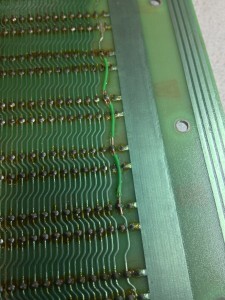 The circuit board was in good shape. 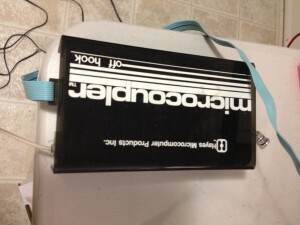 I removed the strange ID4 add-on wire (mentioned in an earlier post) and returned the jumpers to ID1 and 2. I had no terminator resistor pack, which needs to be installed in the last physical drive in the chain, so I had to manufacture one. The service manual mentioned a value of 150Ω so I grabbed some 1/4W resistors, cut them to length, and inserted them into the terminator socket. 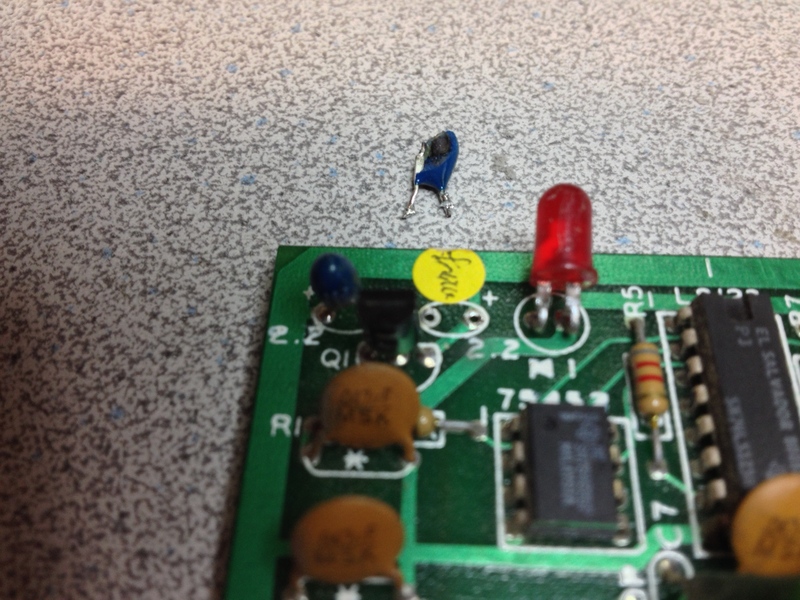 The on-board electrolytic capacitors were checked for tolerance and ESR, and all passed. I couldn’t locate any tantalum capacitors (good). The drive rails were in good condition, but needed a clean and some lubrication. The heads had a bit of oxide build-up, so had to be cleaned. 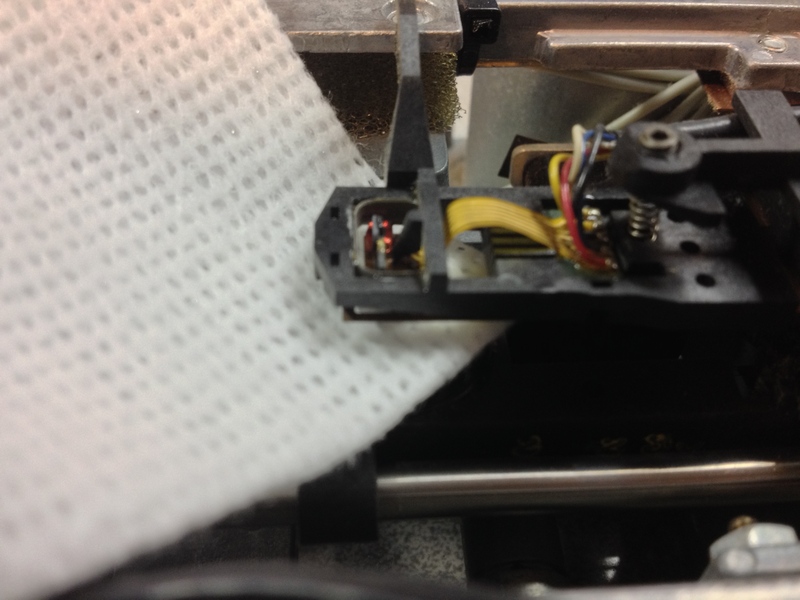 I placed a lint-free wipe soaked in isopropyl alcohol in between the two heads, and closed the mechanism so the heads pushed up against the wipe. The bottom head is a nice solidly mounted head that I’m used to seeing in 5 1/4″ drives, however the top head was a very delicate unframed head held in place with a fragile-looking spring mechanism. Any lateral force (such as pulling the wipe sideways) would possibly bend this mounting mechanism, so I had to be careful. Several open-close motions cleaned the oxide buildup from the heads quite well. After re-assembling the drives, I powered them up using a current-limited supply, to make sure there were no shorts. Everything looked good, so it was time to mount them back in the case. It took me a little while to determine NorthStar’s factory placement of drive 1 and 2, but after some digging, I was able to find out that drive 1 was the right-most drive (not what I would have guessed, but I’m trying to be authentic). For such a spacious case, the floppy drives are quite a squeeze, and it was a careful dance to get the drives partially in place, then the power and data cables connected, then sliding the drives all the way in. I learned the hard way that this procedure had to be performed with both drives at the same time, after many attempts at doing the drives one at a time. The machine is really starting to look like a real computer now. Once I get the floppy controller back in, I should be able to attempt a boot! My Memory – It’s All Coming Back To Me Now! As I mentioned in my last update, I was without any NorthStar RAM for this machine. 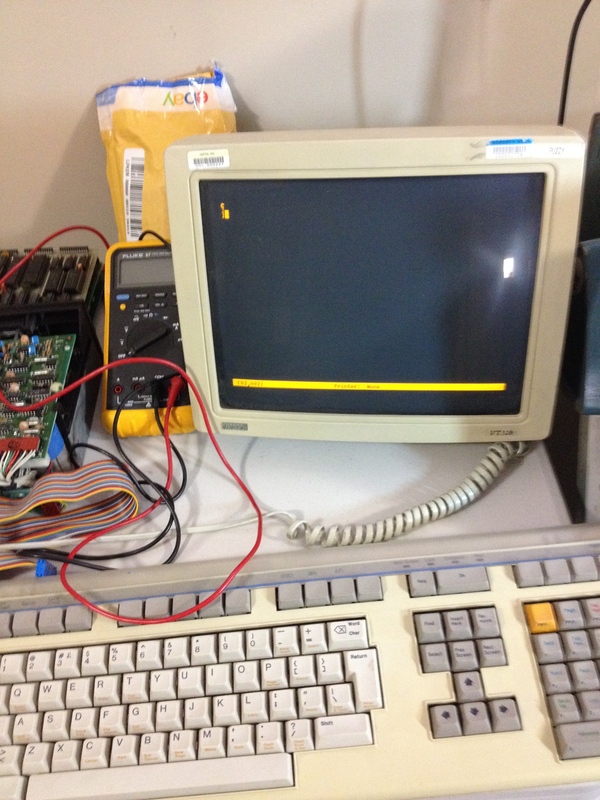 I spent several hours trying to get the Dynabyte 64k board running, but didn’t get much success. Unable to find any documentation for the board online, I had to try to reverse engineer the bank switching scheme used. I managed to figure it out, and was able to use my monitor to switch banks on and off, I was unable to get the RAM to actually work. I could read just fine, but writing always resulted in the value FF being deposited. I was starting to think that this might be the end of my Retrochallenge (what use is a machine with no RAM? 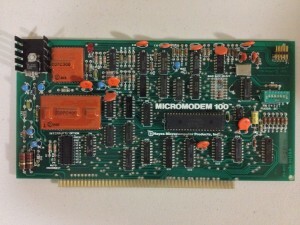 ), so I put out a plea looking for S100 RAM boards in a couple of retro mailing lists. I received a couple of offers go help, and incredibly I was able to locate not one but TWO NorthStar memory boards right here in my small home town of Kelowna (population approx. 120,000). He even threw in an S100 extender board! 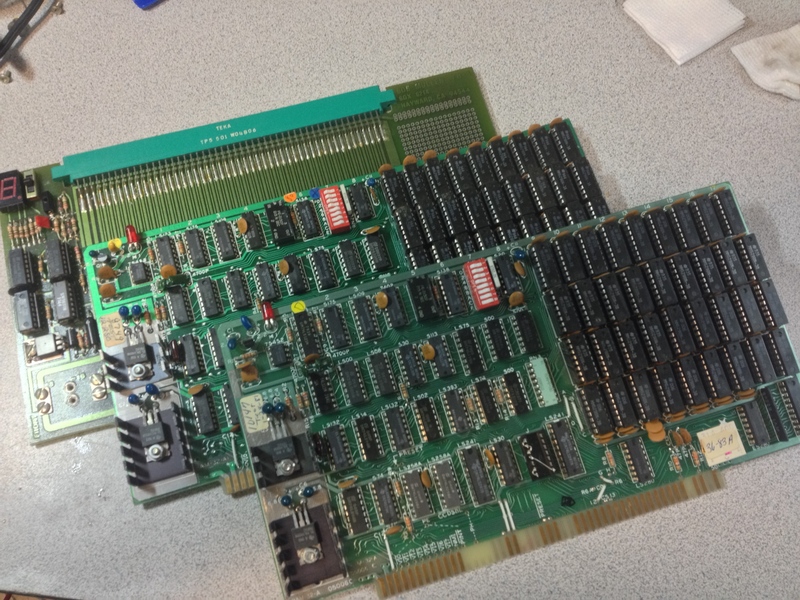 These memory boards – part number RAM-32-A – were much better to work with because of the ready availability of documentation. 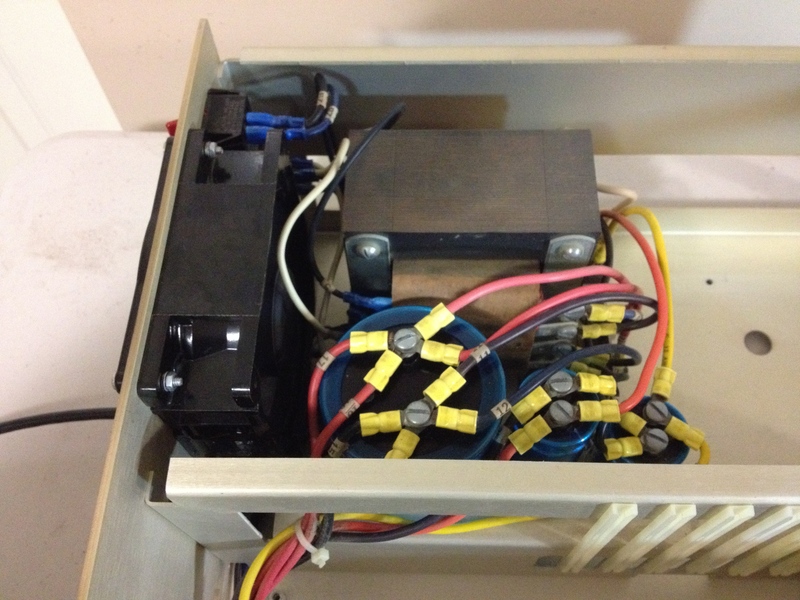 The first steps were familiar to me now – test all of the tantalum capacitors for shorts. 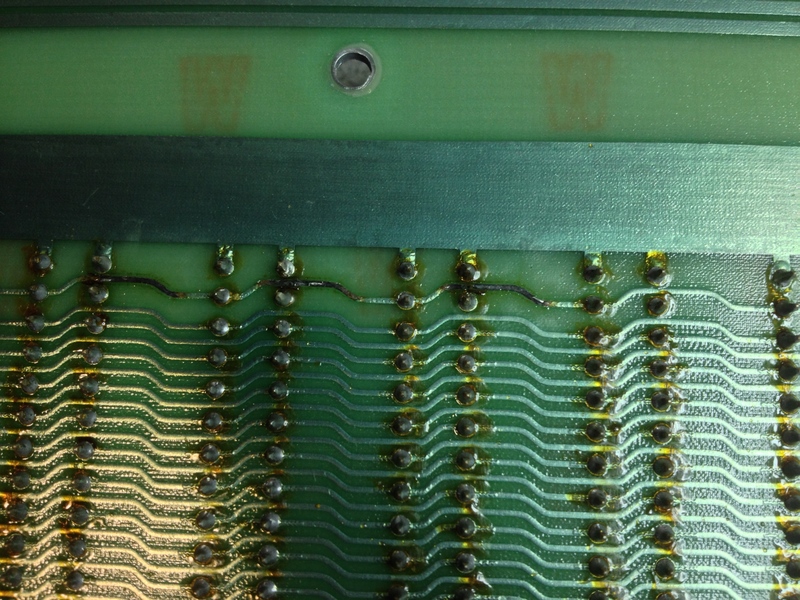 One of the boards had a tantalum that had already experienced a catastrophic failure – half of it was missing. I dropped in a replacement, then tested the power rails by bringing each one up on a current-limited supply. Both boards passed these tests, so now it was time to test each board in the Horizon. 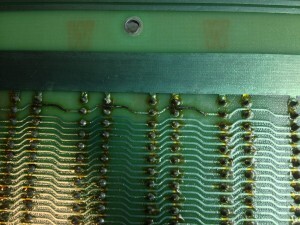 One board failed completely – the red LED didn’t even light up. However, the second board showed very encouraging signs of life. Using the documentation to enable each 8k bank one at a time, I was able to deduce that all banks were working, however not all banks worked in both bank locations (each bank can appear in one of two locations, or be switched off completely). I suspected the DIP switches as the likely culprit, so I tested the switches with my meter – yup, several switches had a very high resistance or complete open circuit. 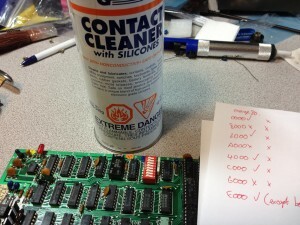 A quick spray of contact cleaner and some vigorous switching should clean those up. 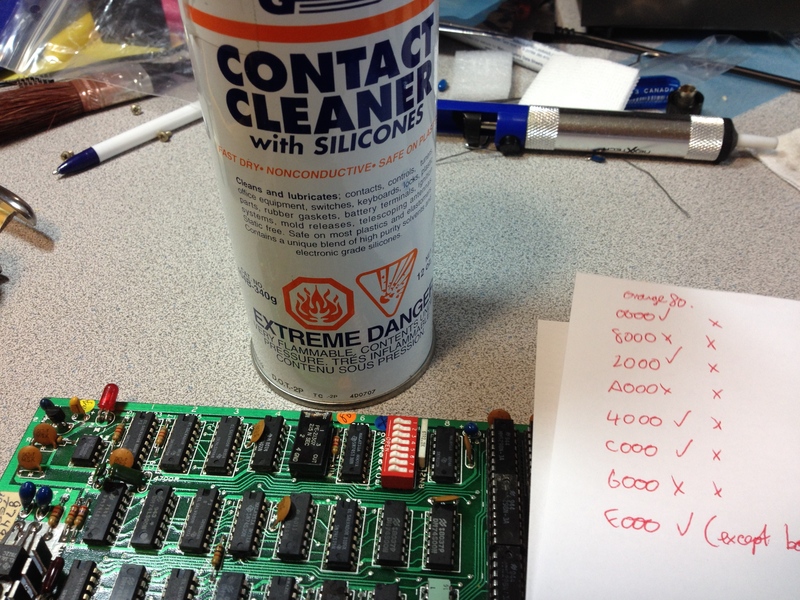 I could only locate my lubricated contact cleaner, which is not ideal for this application (it’s more useful for things like relay contacts), but because my regular contact cleaner was MIA, this would have to do. Sure enough, this fixed it! 32k of beautiful error-free RAM. My monitor ROM has a memory testing function, so I left this running for several hours, and not a single memory fault! I will save the debugging of the second board until later, but for now I have a respectable 32k to play with. I think the next step is to get the floppy drives going, and eventually get to the point of writing a boot disk. After re-assembling the motherboard inside the cassis and hooking up the power supply, it was time to check the power rails and make sure everything was working. I threw the switch and the power supply came to life. I probed the power supply voltages as they arrived at the motherboard and everything looked fine. However, when I checked for power at the backplane sockets themselves, I discovered that the -18v rail was missing from about half of the sockets. Because the rail was there for half the sockets and not there for the other sockets, it must be a fault on the motherboard. Several dozen screws later (actually, only 8, but it feels like more), I pulled the motherboard out and did a visual inspection of the underside traces. 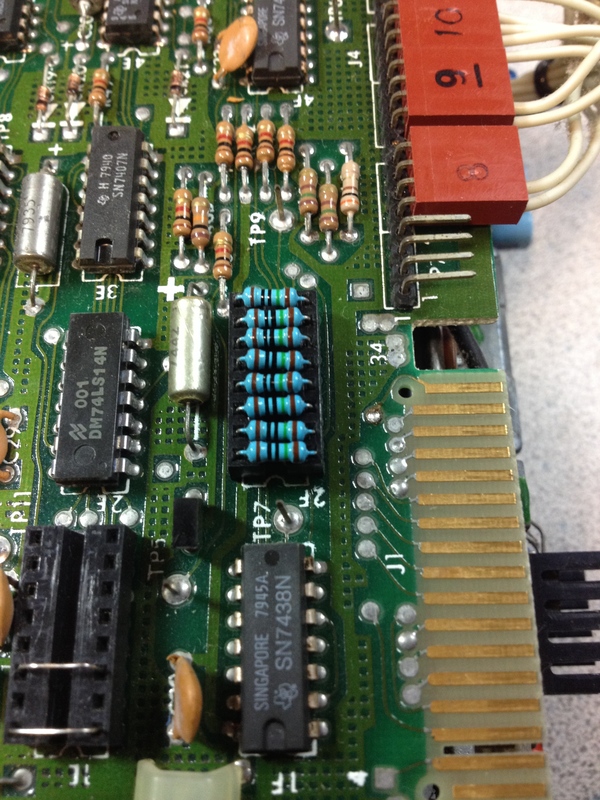 I’m not sure how I missed it when I was cleaning the board, but this time it was obvious – a burned out trace. 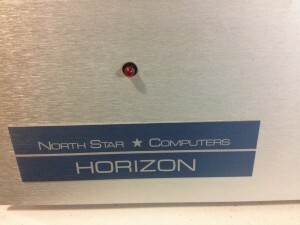 There’s a serious design flaw in the NorthStar Horizon – the power rails from the linear power supply go straight to the backplane without any in-line fuses. 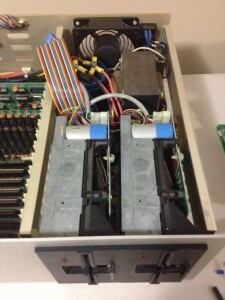 Later S-100 machines have fuses on the backplane which would have protected the motherboard. If this was my machine 30 years ago, I probably would have retrofitted some fuses, but this machine has gone from a functional tool to a museum curiosity, so now isn’t the time to start making modifications. I identified three areas in the trace that had burned through, and carefully scraped away the destroyed trace. The trace winds its way between connector pins, so I used a small piece of insulated wire to re-connect the trace. A quick test with my multimeter made sure that the trace was reconnected and there weren’t any shorts to adjacent pins. I reinstalled the motherboard with it’s several dozen screws, and re-connected the power supply. This time, all the voltage rails were now visible at all the connectors. I am now ready to start plugging in boards and getting the old beast to show some signs of life. After reconditioning the capacitors and cleaning out the chassis, I continued working on the power supply. There’s actually very few components, so it was pretty easy to check. The bridge rectifier and two rectifier diodes were a simple matter of testing with a multimeter. 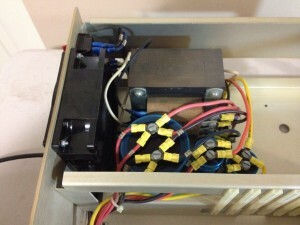 The transformer was tested for open or shorted windings. After cleaning and re-assembling the back panel, I noticed that the fuse holder wasn’t closing correctly. A quick examination showed that one of the metal fuse contacts was broken. A quick rummage around my junk pile found a suitably aged replacement. I reinstalled the capacitors and it was time to apply power. No smoke! All three power rails came up beautifully. The fan – an item I was sure would need replacing – is remarkably quiet and smooth running. The icing on the cake for this part of the project was getting the front panel LED mounted correctly. The original plastic clip that held the LED in place was broken. Fortunately, I had some very similar LED clips in my parts bin, so with a little bit of gentle persuasion I was able to get the new clip installed. I’m suspecting that over the period of 36 years, the industry standard sizing for LED packages may have become ‘metrificated’ (I know it’s not a word, but I’m owning it) so it was a little bit of a tight squeeze, but it’s in there and it looks beautiful. The NorthStar Horizon is unique among S-100 machines because the motherboard is more than a passive backplane. The Horizon’s motherboard contains circuitry for two serial ports and two parallel ports (one in, one out). There are voltage regulators on the motherboard that supply power to the serial and parallel circuitry, and they also provide the power for the two floppy drives. My motherboard had the same corroded IC pin issue that I found with the CPU board. A quick brush with a glass pen took care of that. 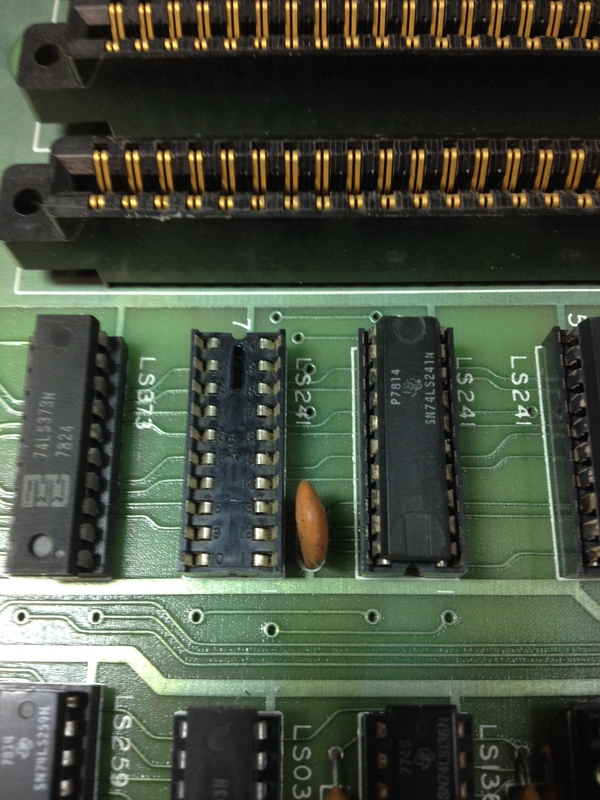 While taking great care to make sure each IC was put back in the correct socket with the correct orientation, I discovered that the original builder had inserted a socket in backwards. Trying to de-solder the socket and put it in the right way round could potentially cause damage to the board, and with an IC in the socket, the incorrect orientation isn’t noticeable. 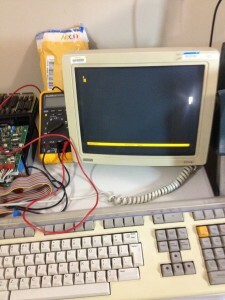 While the motherboard is out of the machine, I took the time to note the jumper settings for the serial ports – knowing the serial configuration will certainly be useful when it comes time to talking to the machine 🙂 The first serial port is configured for 9600 baud, and the second serial port is configured for 1200 baud. These values seem like a reasonable place to start, so I’ll leave them alone. Next, the capacitors needed testing. There are three 6.8μF tantalum capacitors on-board. All of them measured within tolerance. The ESR (equivalent series resistance) seemed a little high, but a quick search of Digikey shows ESR values for modern tantalum capacitors for this value ranging from 2 to 8 ohms. I then brought up each of the power rails with a current-limited supply to make sure there were no shorts. I now have to wait until I’ve reconstructed the linear supply in the chassis before I can re-install the motherboard. So far, everything is looking good.